Six months after the outbreak, a man and woman have survived by isolating themselves in a remote cabin. Starved for resources, they must confront the horrors that threaten them from outside and from within. “Baby, maybe we’re just both crazy. What if we’re, like, in The Truman Show ? I’m certain that many will speak disparagingly about this movie. Typical statements as a total lack of tension, a deadly dull storyline, a cheaply produced film at a single location and the absence of confrontational, brutal and bloody images with zombies feasting on human flesh, will be used in abundance. But admit it, most zombie films use the same clichéd image of a slow walking living corpse, hungry for fresh blood, with a pale gray face with lifeless eyes in dark eye sockets staring into nothingness. “World War Z” used a very different approach to the phenomenon zombie and their characteristics were highlighted in a very different way. 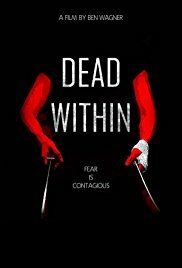 In “Dead Within” you only have the nasty outside sounds and short excerpts of transformed creatures. And frankly, I thought the opening fragment with those awful noises was quite frightening: the primitive growling and screeching nocturnal creatures (weird but it reminded me of “Jurassic Park“) and the cries in terror of the victims being dismembered. Turn the sound wide open and those hysterical cries will give you the shivers. Apart from the opening scene (a staggering three split view with out of sync customized images) and the final scene, the complete film takes place in a wooden cabin somewhere in a forest at an unknown place. We see how Mike (Dean Chekvala) and Kim (Amy Cale Peterson), along with their newborn baby Lily and dog Teddy, arrive at the cabin of their friends Todd and Erika, where they probably expected to enjoy a long relaxing weekend. First there are fragments of them socializing. But this is abruptly broken off, and we see Mike and Kim on a dowdy mattress with a machete and a kind of riotgun by their side. After a while we learn that they are hiding for 6 months already in this barricaded hut, letting noone inside because a deadly virus has spread (though if that happened locally or globally is a non-answered question) which transforms living creatures into black-eyed undead with ink black blood flowing through their veins. Apparently it affects every living being (the dog Teddy is a living proof of that). I asked myself at that time if there could be deadly squirrels or rabbits creeping through the woods. For the horror freaks who enjoy gory movies with plenty of severed limbs and gore scenes, I can already tell them this will be a total disappointment. The only thing we are witnessing is the gradual change that Kim is undergoing caused by the total isolation. Mike is the only one who leaves the cabin on a regular basis (risking his health and life every time) to seek for food and other consumables. Kim tries to kill her time by cleaning up once again, playing the guitar and to create a wall painting. It’s obvious that after a while the two survivors not only need to fear what’s wandering outside, but also realise that the growing paranoia and the realization that their situation seems to be hopeless becomes a threat. We see Kim evolving into a state of fairly psychotic behavior with delusions and conversations with imaginary people. Is it an excellent movie? No, not exactly. The repetitive situations and the lack of information won’t make it an exciting movie. The use of flashbacks provide a partial explanation but after a while that starts to innervate anyway. The minimalistic use of real horror images also isn’t an advantage. Is it a dreadful movie? No, not exactly either. The inner tension and the constant threatening atmosphere made sure it was entertaining in a way. And especially the performances of the two protagonists is magnificent. It’s not obvious to portray such a situation in a convincing way. It’s the same familiar situation as with two people who sat together for a long time in a confined space and trifles start to irritate them. “Dead within” is an atypical zombie movie where the emphasis is more on the psychological state of mind of survivors than on the destructive nature of mutated creatures. A survival film avant la lettre with anxiety, guilt and madness as a central theme.